If our old friend Harold Camping was wrong about the timing of the End of the world (and he, though steeped in the Bible, seemed to miss Jesus' very obvious points, above), then could the ancient Mayans be right? Could tomorrow, December 21, be the end of the world? (Of course, the media has reassured the public that this cannot be the case, since the Long Calendar of the Mayans only indicated an ending that day, implying a cyclical new beginning the next day.) Still, perhaps we have an opportunity to engage in a little apocalyptic reflection--and consider how it might impact our lives. Jewish, Christian, and Muslim theologies all teach that the world will not roll on endlessly. Each of these monotheistic religions (at their basic level) look ahead to the end of the world and a final judgment. This couldn't be clearer to a pilgrim visiting the Old City of Jerusalem. 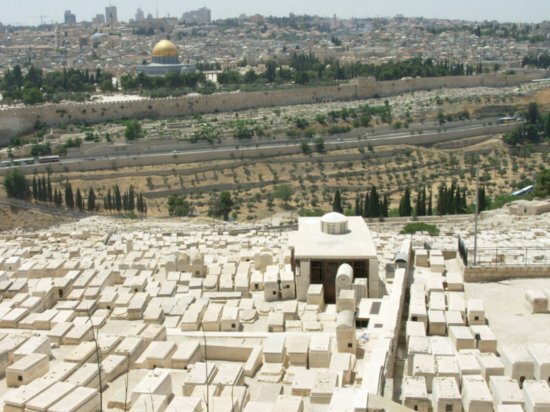 As you look westward from the top of the Mount of Olives (the site of Jesus' ascension into heaven in The Book of Acts, Chapter 1), you're overwhelmed with tombstones in the Jewish Necropolis, the cemetery in the prime position, Jews believe, to participate in the resurrection on Judgment Day. These are stadium seats, the best seats, for the faithful as they look ahead. Across the Kidron Valley, on the slopes of the east edge of the Temple Mount, is a Muslim burial ground. They too believe that here, in the Valley of Kidron, will come the end of the world and the resurrection of the dead. And Christians have traditionally believed the same: that though the signs of the end and specifically of Jesus' second coming, will be universally visible, Jesus will likely return to the place from which he ascended: this very same place above the Valley of Kidron in Jerusalem (see Acts 1:11). Now we can debate the specifics of this 'til the cows come home. The point I want to make is one that seems so appropriate for Advent: the call to live in a state of readiness. Advent, for Christians, is a season where we reflect that we live "between the times"--of Christ's first coming in humility as a baby in Bethlehem and Christ's second coming in glory at the end of the world. Advent calls us to look backward in thanksgiving, wonder, and worship; it also calls us to look forward in hope, anticipation, and appropriate eschatological readiness. Eschatta what?! It's a recognition that Jesus could come back at any moment. And, if his words are correct, we won't know the moment. For that reason, I doubt that tomorrow's the day. Because of this "reverent agnosticism" about the End's timing, we must live in readiness, on tip-toe. This doesn't mean living with anxiety or fear: no, if Jesus is our friend, Savior, and Good Shepherd, his return for believers will be great joy. My favorite verse to remind me of this is John 14:3 "And if I go and prepare a place for you, I will come again and will take you to myself, so that where I am, there you may be also." I love that! So what does readiness look like? First of all, especially for the not-yet-believer (and I hope there are some reading this), it means getting to know Jesus, drawing close to him, speaking with him honestly about where you are (and are not) in your faith journey. Ideally, if you're ready, it means kneeling before him and praying a simple prayer of surrender. It could be something like this: "Jesus, I'm learning that I can't--and I don't want to try anymore to--run my life by myself. I mess it up. I grow fearful, empty, and confused. Deep down I realize I need you. I want you. Come into my life. Save me from all the things I've done that I regret. Save me from missing so many opportunities to love and do good. Be my Savior. Lead my life. I open myself to you. Amen." Praying that prayer, or something like it, if you haven't done so already, is the best way to get into a posture of readiness. 1. Keep short accounts. If there are patterns of sin or rebellion in our lives, if there are damaging habits or harbored resentments, bitterness or unforgiveness, we must confess them--first to God in Christ and then, if and as God leads, to those we may've injured. This helps us travel light through life--and be ready. 2. Seize the Day. Today's all we've got. Yesterday's gone. Tomorrow's not here yet. What opportunities does God give us to love someone today? How might we speak a word of encouragement today? Help a neighbor? Give generously of our time and money? Do it today! 3. Invest in relationships. "Love God, love people, the rest is just commentary." That's a paraphrase of ancient Jewish and Christian wisdom. Strive to create or mend or otherwise build up your relationships. Don't live in regret. Jesus said to his followers: "Servants are fortunate if their master comes and finds them doing their job" (Matthew 24:46). We don't know when the Master will return. We have no say in that. What we do have a say in is how we will live: will it be in readiness, doing our job faithfully? "What Does Christmas Have to Do with Easter?"